Sweet Angel Figurines Shelf Decoration. 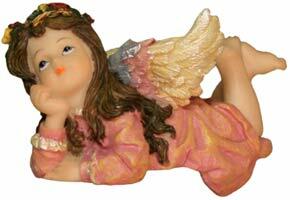 This angel figurine's shelf decoration is 2.5 inches tall, 4 inches wide and made resin. She rests on her tummy on any shelf, desk or flat surface. One of her hand's are prompt up on her chin while the other one is folded in front of her. Her long brown hair has sweet curls at the end with a flowered halo around her head. She is wearing a pink dress that matches the pink in her sparkly wings. They start off blue, then turn pink and finish off ivory. This Sweet Angel Figurine's Shelf Decoration has a halo that consists of flowers and leaves.